After thirty years of investigation, a team of scientists from six European countries reports that the hypergiant star HR 8752 is partially traversing the Yellow Evolutionary Void, an area in the Hertzsprung-Russell diagram empty of hypergiant stars with surface temperatures between 5000 and 12000 degrees kelvin. Some of the observations were carried out using the Utrecht Echelle Spectrograph (UES, now retired) on the William Herschel Telescope. They show that in the twenty years from 1985 to 2005, the star's surface temperature rose from 5000 to 8000 degrees, while undergoing a series of strong mass-loss events. During this time, the radius of HR 8752 shrank from 750 to 400 times that of the Sun. These observations indicate that HR 8752 is traversing (part of) the Yellow Evolutionary Void. The astronomers found that the atmospheres of hypergiants are unstable inside the Void because the outward forces in their atmospheres can match or even overcome the inward gravitational pull. The resulting instability of the atmospheres causes these enormous stars to lose huge amounts of mass, and consequently to traverse the Void on a relatively-short timescale. The team also discovered that the Void actually consists of two areas where the atmosphere of hypergiants becomes unstable, associated with the ionization of hydrogen and helium gas respectively. Between them, at around 8000 degrees, is a narrow stability strip where the atmospheres are more stable. Artist's impression of the hypergiant HR 8752 traversing the Yellow Evolutionary Void. The graph shows the star's surface temperature (log Teff) as observed over the last 100 years. 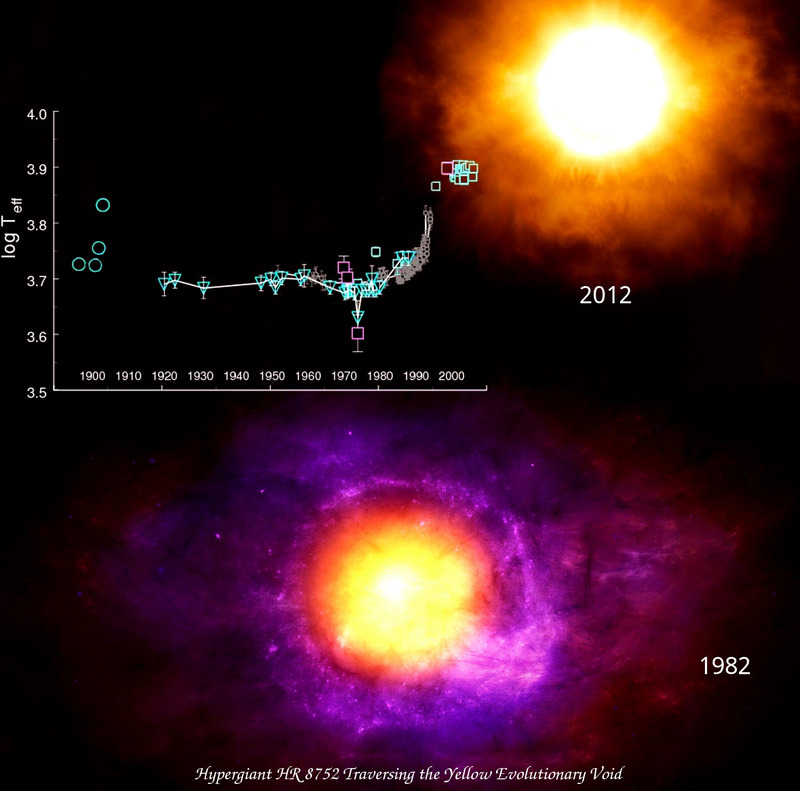 It increased from ~5000 to ~8000 degrees between 1985 and 2005, while the hypergiant's radius decreased from 750 to 400 times that of the Sun. Image credit: A. Lobel (ROB) [ JPEG ]. While an analysis of earlier photometric observations of HR 8752 showed that, at least from ~1900 to ~1980, HR 8752 stayed at a nearly constant surface temperature of 5000 degrees, the team had some indications that around 1985 this remarkable star was fairly close to or even beyond the low-temperature boundary of the Void. Wondering what would happen, the scientists embarked on a long and systematic program of spectroscopic observations that lasted for three decades. Hypergiants are currently the most luminous stars known in the Universe. The study reported here was of a particular hypergiant called HR 8752, which is about 250000 times as luminous as our Sun. It lies in the constellation of Cassiopeia, and can be seen through binoculars. The science team mentioned in this news release consists of Dr. H. Nieuwenhuijzen (SRON Laboratory for Space Research, Netherlands), Dr. C. de Jager (NIOZ Royal Netherlands Institute for Sea Research, Netherlands), Dr. I. Kolka (Tartu Observatory, Estonia), Dr. G. Israelian (Instituto de Astrofisica de Canarias, Spain), Dr. A. Lobel (Royal Observatory of Belgium), Dr. E. Zsoldos (Konkoly Observatory, Hungary), Dr. A. Maeder (Observatoire de Geneve, Switzerland), and Dr. G. Meynet (Observatoire de Geneve, Switzerland). H. Nieuwenhuijzen, C. De Jager, I. Kolka, G. Israelian, A. Lobel, E. Zsoldos, A. Maeder and G. Meynet, 2012, "The hypergiant HR 8752 evolving through the yellow evolutionary void", A&A, 546, A105, which is an Open Access paper (also available at http://www.cdejager.com/hypergiant-publications/). YouTube video: http://www.youtube.com/watch?v=BOqsPJZoifo, by Orso Byanco.